Thanks tt for helping me save $! Thank you! I love your website! i already like Totally Target on FB!! How cute! I would love this one! I also follow Totally Target on facebook! What a fun gift card! I blow bubbles to play with my dogs all the time- if you’ve never watched dogs try to catch bubbles you are missing out on cheap entertainment for you and them both! I would love to win this! Your giveaways are always so fun! I shop at Target all the time, so I would love to win this. This is too adorable! Love. target ! Free money to spend at Target would be great!!! Hello!! Would love to win!! Thanks for all that you do!! I follow TT on facebook and love all the deals! 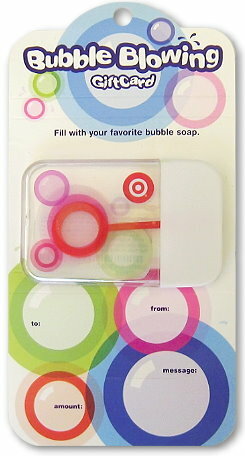 Another cute Target gift card, I want to win. This card is soo cute! I would love to win this. Thanks for all the great deals you post! Very Cute card I would give it to my daughter for her birthday coming up in june, she is a couponer in training! We are a bubble blowing crazy family. THis would be perfect!! Good Luck Everyone! I love this gift card. Thanks for the chance to win.